This comfortable Autism Sweat Shirt features the words "I Love Someone With Autism". It is 50/50 and basically will not shrink much. Available in S, M, L, XL sizes - choose from the drop-down menu when ordering. 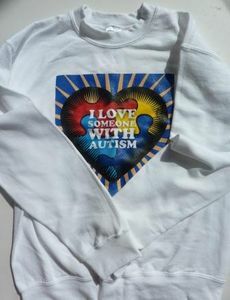 Check out our full selection of Autism Apparel for comfortable and fun ways to show your support.